The Whistle pet fitness tracker lets you easily track your dog’s behavior and activity by clipping the device onto your dog’s collar and then downloading the Whistle app to your phone. The design of the Whistle is a little different than most of its competitors, as it attaches to the collar rather than hanging down. The app lets you target exercise goals based on your dog’s age, breed, and weight. You can also log daily notes about feeding and medicine schedules. One of the really cool features of the app is the Communication Hub that lets you communicate with family, friends, dog walkers, and anyone caring for your pet. The app also lets you take pictures that you can share with all your pet’s caretakers. What do pet owners love about Whistle? Users love the ability to set fitness goals for their pet based on other dogs of the same breed. Some users find that they thought their dogs were getting more exercise than they were, and this device helped them get motivated to step it up. Customers also love the ability to monitor walks taken by hired dog walkers; it is helpful to know what time they are walked as well for how long they are walked, so you know when they need to go out again. Users who have multiple people caring for a pet love the food tracker features, as well as the medication reminder that can be super helpful in keeping your pooch healthy (think about how hard it is to remember heart worm and flea prevention medicine). Some users find that the device doesn’t sync to their phone quickly, so they have to refresh it numerous times so that it updates. Another common complaint is that the unit isn’t quite as durable as users would like to see, some customers have found that it falls off if your pet is rambunctious or very active. The set-up has been reported by a number of reviewers to be difficult, but once you get it going it is well worth it. 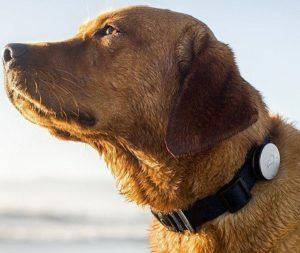 Despite a few minor problems that the support at Whistle are quite good at resolving, the majority of users love using this pet tracker and find that it makes taking care of a beloved dog on a daily basis much easier and more fun.